We had a GREAT morning fishing the Wrightsville Beach Jetty and Carolina Beach Inlet. We started our trip around 9am with the boat loaded with Live Shrimp and our light tackle inshore fishing gear loaded and rigged, I set course for the Wrightsville Beach Jetty. We had several lines rigged with a varying approach to target our species for their feeding patterns (a float line, bottom line and drift line all are very important when fishing with live shrimp). 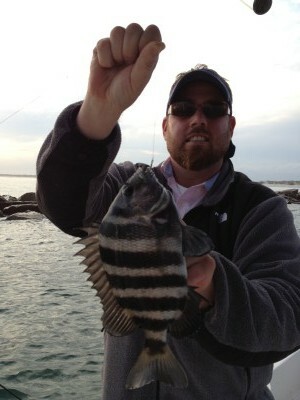 We caught Sheepshead one after another at the South Wrightsville Beach Jetty as they could not resist the live shrimp. We then found the Tautog in the deeper water at the end of the Jetty! Tautog are a very good eating fish that come to our area in the winter months and are a GREAT inshore fishery both Wrightsville Beach, Carolina Beach and Topsail Island! After catching numerous sheepshead and tautog, we decided to venture offshore of Masonboro Island and Carolina Beach. We caught numerous seabass on the bottom that we had to release due to the seasonal closure; however, the highlight of the day was seeing a Wright Whale right off the beach migrating to its wintertime feeding grounds! There is nothing more exciting than seeing a whale while you are fishing off of Carolina Beach or Wrightsville Beach! All and all it was an Excellent morning fishing with lots of smiles and fun! This entry was posted in Fishing Reports, ProFishNC News and tagged Carolina Beach Fishing, Inshore Fishing, Wilmington Fishing, Wrightsville Beach Fishing on February 27, 2013 by admin.